Utilizing state-of-the-art equipment and procedures, we will test soils extensively around and under the oil tank until we feel we can guarantee the tank test. We don’t just test soils around the oil tank, but we extend under the tank as well. If we test your oil tank and it passes 100%, and upon removal or abandonment, the tank is found to have discharged oil up to 30 days after the test date, Steve Rich Environmental Contractors will pay for the environmental cleanup up to $20,000.00. All the companies that call themselves ‘tank testing’ companies have a loophole in their reports! The reason is the tank testing cost is relatively inexpensive. If a company was to do such a comprehensive test, the cost of equipment and redundancy to guarantee a test would cost more than removing the oil tank. In reality, the test is good, just not perfect. 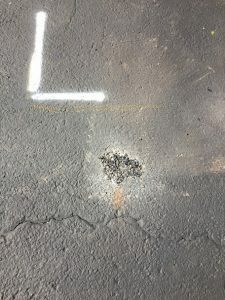 So, before going with a tank testing firm other than Steve Rich, ask the company to put in writing that their tank test comes with a 100% guarantee that if the tank has any holes, any leaks, needs any cleanup, or any thing at all, they will pay for it. The first thing a prospective buyer should know is there is no oil tank test that is 100% accurate. Every tank test has flaws and disclaimers. No environmental company will ever guarantee that there is no leak and no potential liability. Depending on the needs of a specific project, there are a number of tests available. All have their own pros and cons. Except for Steve Rich Environmental Contractors. This type of test is completed by advancing probes down the side of the oil tank and extracting samples. Most probes or augers are about one inch in length. 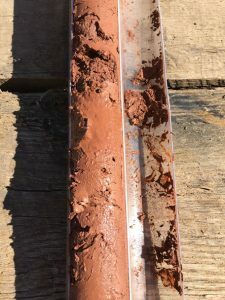 PRO: If samples are advanced under the tank grave further than just the bottom, the test will typically eliminate the risk of a major cleanup. You could however, still be responsible for a cleanup in the range of $3,000 to $8,000 if there is minor contamination. CON: The soil test results will only tell you that in the exact spots that were sampled, there was or was not oil in that spot. This is not a guarantee. There are many versions of this test, but most are regulated by the EPA. Regulations state that the test must be accurate to find leaks that are greater than ten gallons per hour. Often, because of a rusty vent pipe, results can be misleading as to whether a tank is leaking leading to more work. PRO: Finds potential problems in other parts of the tank which might be failing prior to a leak. CON: Not uncommon that tanks pass only to find out a major cleanup is warranted and later prove the tank has leaked 100 gallons. A tenth of a gallon per hour is just less than 2.4 gallons per day. Want to be guaranteed and have some assurance? Hire Steve Rich! While it costs a little more, it offers a guarantee from any added expense provided you remove the tank within 30 days of the job. With our Oil Tank Assurance testing, we use a combination of testing methods to bring our accuracy up to a 99.99% tolerance allowing us to guarantee our results. As part of the agreement, an affiliated Steve Rich Group company must remove the oil tank as well. With Steve Rich Environmental Contractors, you’ll have peace of mind. It is very important to realize that no oil tank test provides enough information to determine the extent of contamination or the cost of remediation. Steve Rich came up with this approved way of testing soil after discovering that EVERY tank testing company had a margin of error. Testing was only accurate within their tolerances, and would not guarantee 100% that there was no contamination in the ground. Remember, when a company badmouths a specific company without facts, they are hiding something or looking to take advantage of you. We will explain our procedures and give you the pros and cons of other procedures. We urge you to not sign with another company before you feel you are 100% covered. One of our experienced technicians will arrive at your site to evaluate an underground storage tank. The technician will locate the fill pipe. They will then check for product and water measurements as well as the depth of the tank, using an oil measuring stick. The exact size, boundaries and perimeter will be established. The technician will then visually check your property for utilities, which include water, sewer, gas, phone, cable, and electric. Using a thin metal probe, the technician will then confirm the tank size by probing the soil to confirm the ends of the tank. Next, the technician will utilize a series of earth boring equipment, including but not limited to augers, rotary hammers, GeoProbe, hand augers and core drills. Soil samples will be collected from 0-6 inches below the base of the tank at most locations. If these are confirmed with field analysis and or a PID meter to be negative of hydrocarbons, a sample will be extended to at least 24” below the oil tank and possibly until ground water is found to thoroughly test the soils. The samples will then be combined in equal amounts into one jar and transported to a NJDEP lab. Example to a patched hole from a probe. On projects where refusal is met (typically rock or concrete at or under the the oil tank bottom), with approval, a standard tank test will be performed at a reduced rate voiding the guarantee (typically only 50% of the price). 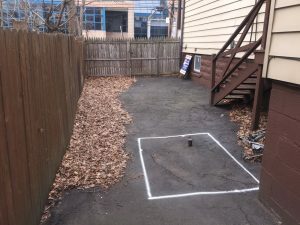 Site conditions vary and the guarantee can only be given when Steve Rich can complete all the work as described, without limitations or obstructions. In cases where full access cannot be achieved, a minimum mobilization fee of $200.00 will be charged. Eddie C. and Mary M.
Dear Juanita, I cannot say enough about your great service. From the person answering the phone to the guys who came to remove our tank, all professional. Removing this oil tank was a big concern for us. But by choosing the right company, Steve Rich, made it for us. It's nice to deal with a company that puts it's customers first, that promptly returns phone calls and answers all of our questions. I cannot thank you enough for doing such a wonderful job. Thanks for everything, the pleasure was ours! Dear Steve, The congregation of Advent Luthern Church would like to thank you for the excellent work you performed on our side walks. The workmanship was professional and neat. Total replacement was not an option with our budget so your solution was perfect. And, our insurance agent was able to negotiate a lower premium on our behalf because of your work. Thank you again. Dear Steve, Just wanted to say thank you for all of your help with the removal of the oil tank at my mom's house. Your staff does a great job and Tracey is the best! She kept me calm and actually took care of the entire process for me – beginning to end. All kidding aside, Tracey knows what she's doing and just does it. Great experience! Dear Contributor, It is true, the new Montville Animal Shelter is now open and functioning and it is largely because of generous benefactors like you who have donated your time, energy, expertise, materials, and much needed monetary donations. Words cannot express the appreciation and gratitude the Mayor and Township Committee feels towards you for your outstanding commitment to the Township of Montville, its residents and especially our animals. To show their gratitude the Mayor and Township Commmittee, Health Department, along with the Montville Pet Parents, wish to invite you to our Grand Opening Ceremony, Saturday, November 16, 2013, from 12:00 pm to 2:00 pm, at our new Animal Shelter, located at 7 Church Lane, Montville, NJ. When it comes to oil tanks, we know this area from the ground up. © Steve Rich and Associates, Inc. All rights reserved. Content may not be reproduced, rewritten or redistributed in any media without our express written consent.